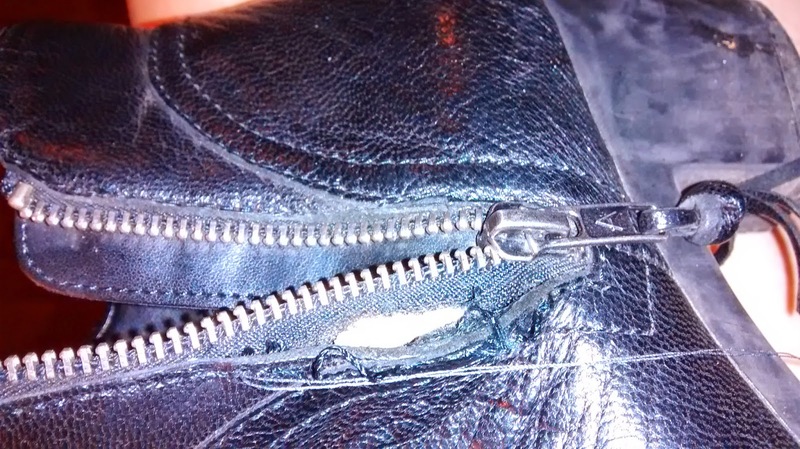 I was so annoyed this March when I realized that my almost new ankle boots were busted; the zipper had separated from the leather of the boot. Although the boots themselves are pretty well-made, the zippers have been a problem from the start; they’re stiff, and especially once I put my own insoles in, the boots were a little tight, and I was doing a lot of tugging and jerking to get them closed. So I guess it’s not too surprising. 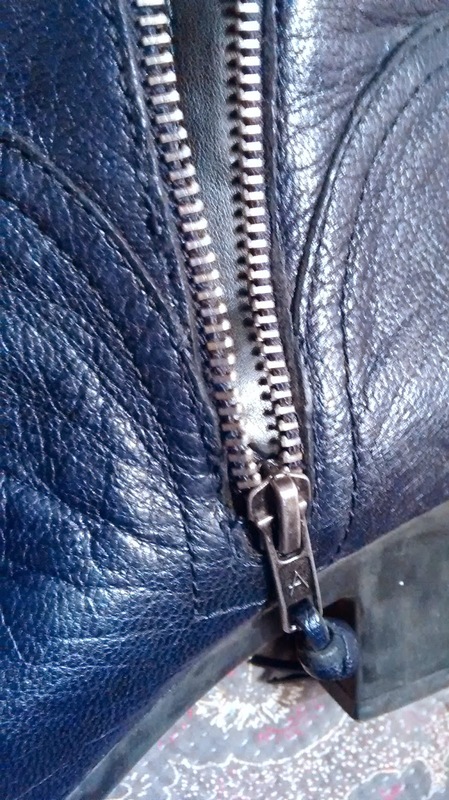 But I looked more closely at the gap and realized that nothing was actually broken; the zipper still worked, and the leather didn’t have worn spots. When I was in college I learned that not everyone took their busted-but-not-broken shoes to the cobbler; in much of the U.S. there just isn’t a cobbler, so people buy cheap shoes and then toss them. But in the cities I’ve always lived in, there’s always been an old Eastern European or Italian or Greek guy nearby with a little stuffy shop full of shoes in paper bags waiting to be picked up. 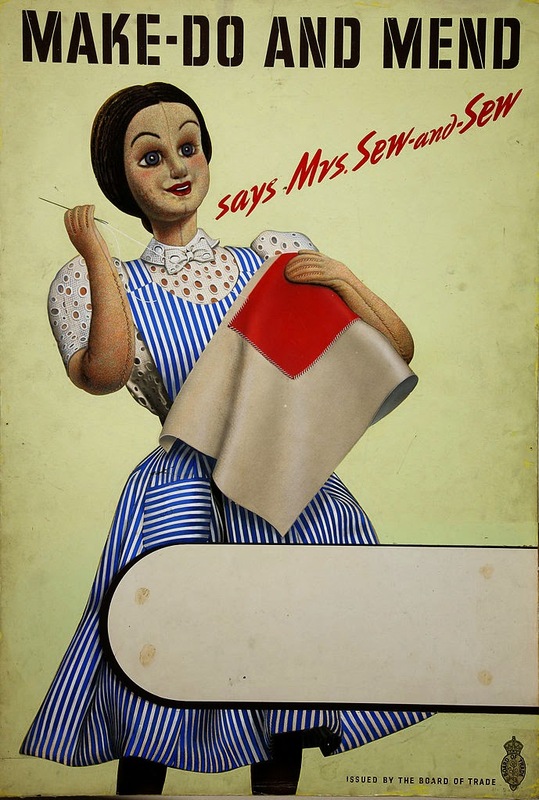 Once we were old enough that we wore shoes down rather than just outgrowing them, we joined our parents in semi-annual trips to have shoes re-soled (I always wear out the edges of the heels), weatherized, re-stitched…. This time, though, I was in the middle of paying off my student debt and I didn’t want to spend money for the cobbler when I thought I could deal with it myself. I didn’t have the time to deal with it right then, though, and it was the end of winter; I was about ready to switch to sandals. So I just packed them up and moved them, but now, with fall coming on, it was time to get the job done. Mending something like this needs one special tool: a leather needle. You can kind of see in the picture that, unlike a normal needle, which has a more or less round shaft, a leather needle is flat. They’re also razor-sharp. They work brilliantly; unless you’d used one, you wouldn’t believe how easily they slice through leather like it was butter. 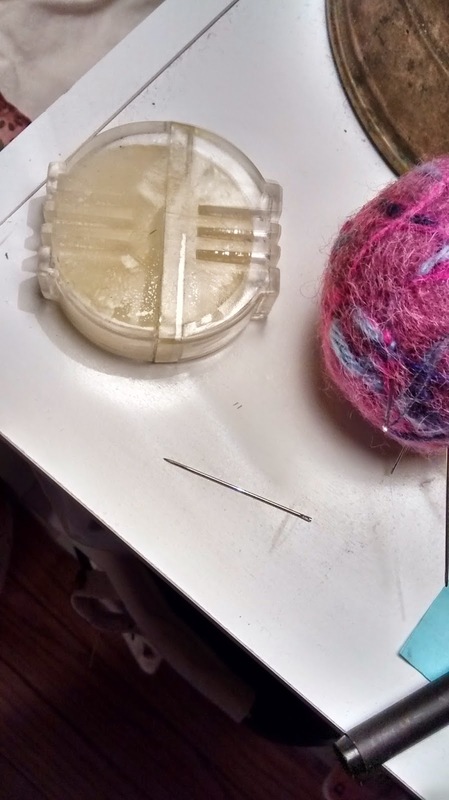 I also used the other thing in that photo; it’s beeswax in a plastic container with a groove in it so you can drag your thread through the wax. It gives thread extra strength, and I’m also hoping for a little weather protection. I’d say that’s optional for something like this, but since I already had it, why not? Anyway, the job itself took something like three minutes. I dunno if it’s exactly as good as new, but I definitely think it’ll hold up. I want at least another year out of these boots, hopefully two, so it had better! I need to glue the soles back on a few of my pairs of boots. The leather is in great shape, but I have the bad habit of pushing my shoes off with my other shoe… so it separates the heel from the shoe itself. I am all for fixing them rather than tossing them. The leather in your boots looks awesome… makes me want to touch them (I’m a weirdo with soft leather). Good job on fixing them! Very smart! I had no idea there was such a thing as a leather needle. For a while I was in the union that takes care of costumes on Broadway. I tell you what, I should’ve stayed — that work started at, IIRC, $28 an hour, with overtime once you passed 8 hours a day or 40 a week. Much better than academia. Nicely done! I hate shoe shopping, so I try to hold on to my shoes for as long as possible. I stopped wearing heels a couple of years ago, but there was a cobbler a few blocks away from my office that would replace the soles for $7. Not too shabby. $7 for a sole replacement is very nice. And I agree, shoe shopping is awful. I have a couple of companies that I think make comfortable shoes and I try to just buy from them so I don’t have to worry about it too much, but trying to get something that both looks good and not too frumpy, and I can walk in all day, is tough. When I find something I like, I want it to last. You did a good job! I would have taken mine to the shoemaker but you’ve made it look easy! I love it! I hate to admit I’m one of those people who buys cheap boots and wears them for a year and then tosses them. We all have our ways of making life work 🙂 As I’ve gotten older, I’ve become more inclined to buy the quality thing that will last for a while. I love how trying and succeeding at a repair is so satisfying. The more I try, the more willing I am to try other, even more complicated repairs. I also appreciate the feeling of competence that comes from such tangible work. That is so true — I like doing projects myself when I have the time, both because it’s satisfying to feel like I can, and because it builds my competence; over time I learn to do new things and I really like it.